I love doing reviews and the Super Bowl Pepsi Halftime Show is included. Two years ago it was Beyoncè, last year Bruno Mars (click HERE for that review), and this year KATY PERRY! I’m a huge fan of her music and I was interested in seeing not only what she’d perform, but how she would do it. Out of those five, she performed four. Not too shabby for my predictions. She came out to “Roar’ on a geometric lion in a fiery two piece. Switch over to ‘Dark Horse’ with the same geometric themed set and then insert Lenny Kravitz jamming to ‘I Kissed a Girl.’ She didn’t show too much skin, but she dropped it for Lenny. She then had an outfit change into a beach ball inspired two piece and performed ‘Teenage Dream’ and ‘California Gurls.’ The set for that reminded me her ‘This Is How We Do’ video (click HERE for to check it out) with the dancing shark, beach balls, surf board, and palm trees. Just when you thought it was over, it wasn’t. She kept going and I don’t mean that in a good way. She then brought out Missy Elliot who performed not one, not two, but THREE SONGS: ‘Get Ur Freak On,’ ‘Work It,’ and ‘Lose Control.’ No pop when she came out. Katy threw on a dope hoodie and even did a little choreo during ‘Get Ur Freak On.’ Just a little two step. Missy took me back with the hits though. I surely rapped along. Once Missy was done Katy came back out and did ‘Firework as she floated through the arena on a Star that looked like something from a kids show. I was ok with her other outfits, but I didn’t like the star dress. She could’ve just done all sequins or something. Overall the performance was pretty boring. Boring as in I wasn’t all that interested. There was no pop from the crowd, no buzz. I love that she brought out Lenny Kravitz and Missy Elliot, but this new generation doesn’t know who they are. No one seemed to scream when Missy came out. Lenny Kravitz wasn’t a surprise because they kept saying through the first half that he’d be a part of the performance. How do you bring out someone and have them do three songs and you’re the headliner? She could’ve started rapping or something. It just wasn’t what I expected and when it was over I was ready for the game to come back on. She did too much and while it’s great to bring out other stars during her set, it was just too much music. Never thought I’d say that, but it was. I would’ve preferred for her to elongate the songs she performed. Russell Wilson took a shower and changed into a new uniform during Halftime. That pun right there shows that I could’ve been doing something else. Eh, it was alright. It wasn’t horrible, just not great compared to her predecessors. Well the playoffs are officially over and the New England Patriots (AFC) will be facing the defending champions, Seattle Seahawks (NFC), in Super Bowl XLIX LIVE from the Phoenix Statdium (AZ) February 1st. Bruno Mars Sets Super Bowl Halftime Ratings! 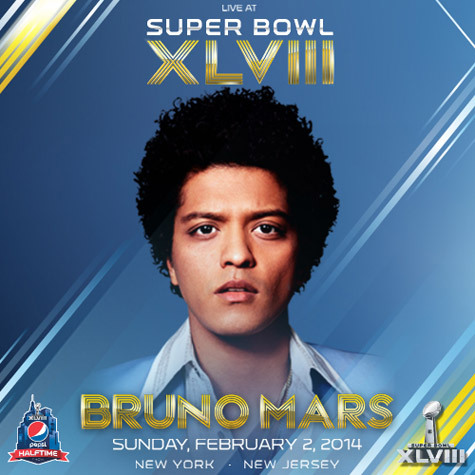 Bruno Mars TORE DOWN the stage at Met Life Stadium last night for the Super Bowl XLVII Halftime show. Check my review here. Well the ratings are in and Bruno has the most-watched halftime show in Super Bowl HISTORY! He topped both Madonna’s (114 million) and Beyoncé’s (110.8 million) halftime ratings with a staggering number of his own, 115.3 million views. The game itself was the most watched event in U.S. television history with 115.5 million views, so prop to Bruno for being just as much the center of attention. On top of that he became the YOUNGEST performer to headline a Super Bowl at 28 years old.